In New York City, an oasis for faceless, domineering wealth, a young woman took advantage of what the appearance of glitz and unending money can earn for you: the trust of everyone around you. In an enthralling article that reads like a modern-day “Catch Me If You Can,” Presser lays out how Delvey duped New York’s elite through a carefully curated identity, fraudulent checks and dubious wire transfers, leaving everyone else to foot the bill—to the tune of hundreds of thousands of dollars. Get stories, reporting tips, and more sent straight to your inbox. Another must read for the week is an in-depth look into how Attorney General Jeff Session’s new “zero-tolerance” border policies are affecting immigrants and courts alike. 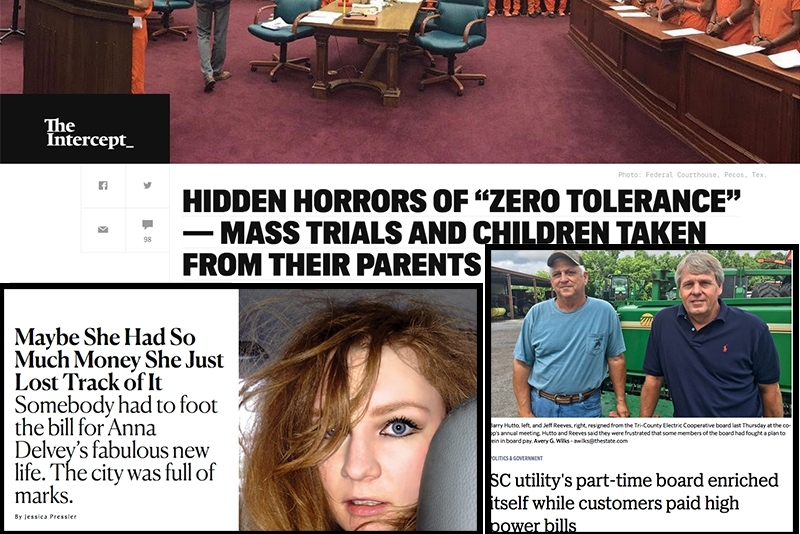 Reporter Debbie Nathan of The Intercept takes readers into a small border-town courtroom, where mass trials have become commonplace in the past few weeks. “…the judge asked many of his questions en masse. This had the astounding effect of eliciting, from otherwise mute and downcast defendants, thundering group responses. ‘Are each of you satisfied with the help of the lawyer?’ the judge asked the huddled people. The article also reflects on the Jeff Sessions-created policy of removing immigrant children from their parents—creating an artful reflection of how the Trump White House dehumanizes asylum seekers. Wilks details how the members convene about once a week, far more than similar groups, to cash in on $450 meeting stipends—accumulating annual pay of about $52,000 a member. In other local news, Steven Goode details in the Hartford Courant how council members in a small Connecticut town dined on lobster ravioli, filet mignon and a $49 Kobe beef and foie gras burger—for a total bill of $2,500, on tax-payers’ dime—all while discussing the upcoming year's budget. Juan Pablo Andrade, who has close ties to the Trump family and is considered a rising star in the GOP, is allegedly a made member of the Genovese crime family and currently under FBI investigation. Predators are stealing entire family fortunes, conning the elderly and infirm out of billions in life savings. Here’s how they do it, and why they rarely get caught. Editor in Chief Brad Hamilton chats with the award-winning journalist about his reporting journey for his new book, "Bad Blood: Secrets and Lies in a Silicon Valley Start-Up." We sent Freedom of Information requests to every state and federal agency asking for payroll data. Analysis reveals insights that can help both the public and private sector work better. How mother-and-daughter activists took on a drilling company to protect their town’s drinking water — and set the stage for a game-changing showdown on corporate versus community rights. What's the Outlook for Young Journalists?